Happy household this weekend as we welcomed a new addition to our family! Our new four-legged love, Jill Hadassah, comes to us with great training under her collar by our friend in Iowa Becky Beach and her Puppy Jake Foundation, along with Canine Craze in Des Moines. The Puppy Jake charity trains dogs for adoption by our service men and women, including those recovering from PTSD, as well as families with special needs. Jill Hadassah has been trained to be Trig’s buddy, and we’re over the moon to finally have her home! Thrilled, too, because all the rescue dogs and cats our kids have adopted over the years will hopefully learn something from our first dog trained to do anything! She’s brilliant and beautiful, and we feel very blessed to have her. Thank you so much, Becky and Puppy Jake Foundation, for working with this tail-wagging bundle of love. We’ll treasure her, as she joins the rest of the current furry members of our family: Lucy, Lola, and Wilson. Please visit the Puppy Jake Foundation to learn more about the great work they do, and join us in supporting them if you feel led to do so! A big thank you to everyone who joined us today for a very festive “Good Tidings and Great Joy” book event at the Billy Graham Library. It was great to see our old friend Charlie from the ’08 campaign trail. He’s growing up into such a beautiful young man. I’d especially like to thank Franklin and Jane Graham and all the staff and volunteers at the Billy Graham Library. If you’ve never had a chance to visit the library, I really encourage you to take time and do so. 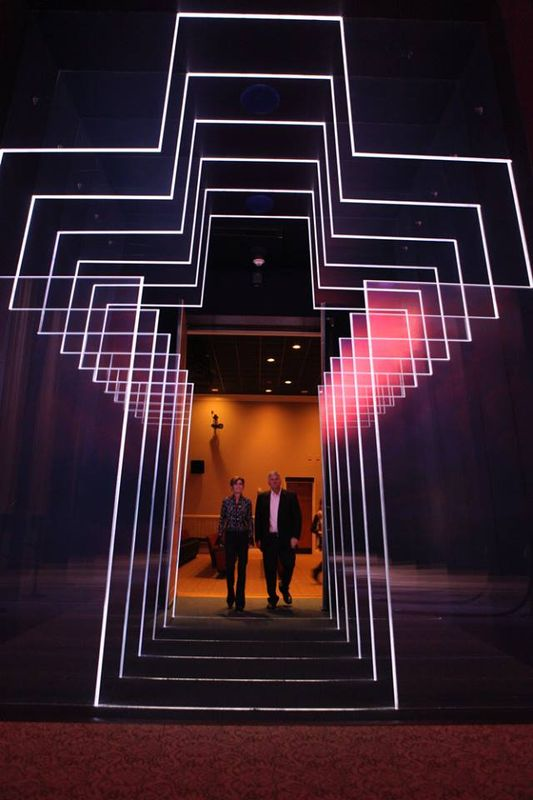 It’s a beautiful place dedicated to telling the story of Billy Graham’s amazing life and continuing his work to bring the Christian message of love and hope to the ends of the earth. Next up, we get to visit with volunteers at Samaritan’s Purse and then it’s on to Roanoke, Virginia, and Monroe, Louisiana, tomorrow! P.S. I had a great time chatting with Bill O’Reilly last night about “Good Tidings and Great Joy.” I had forgotten I wore the same shirt this morning that I did on Fox last night… that is until every other person at the library today mentioned they enjoyed the O’Reilly interview and thought it was cool I was wearing the same clothes! I laughed and explained that this is what happens when you’re living out of a suitcase on the road meeting all these great people! Gov. Palin also posted a gallery of 14 great photographs here. 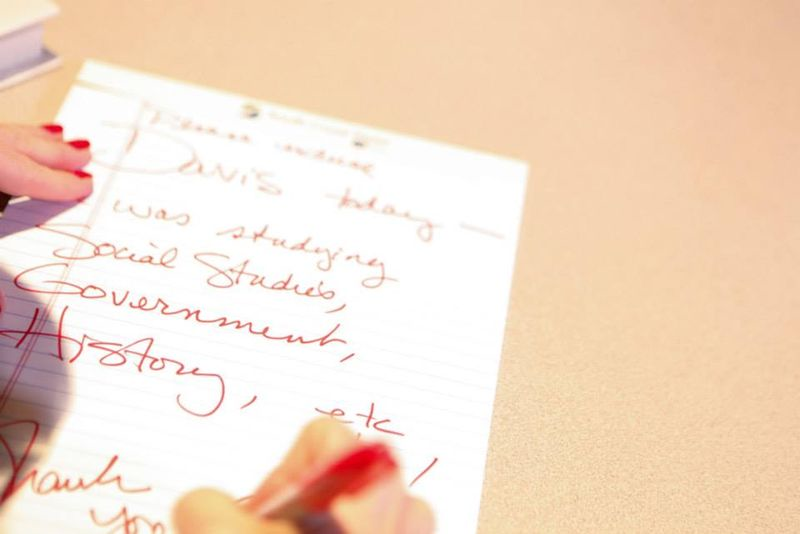 My favorite is definitely this image where she is writing an excuse note for a school-aged child. 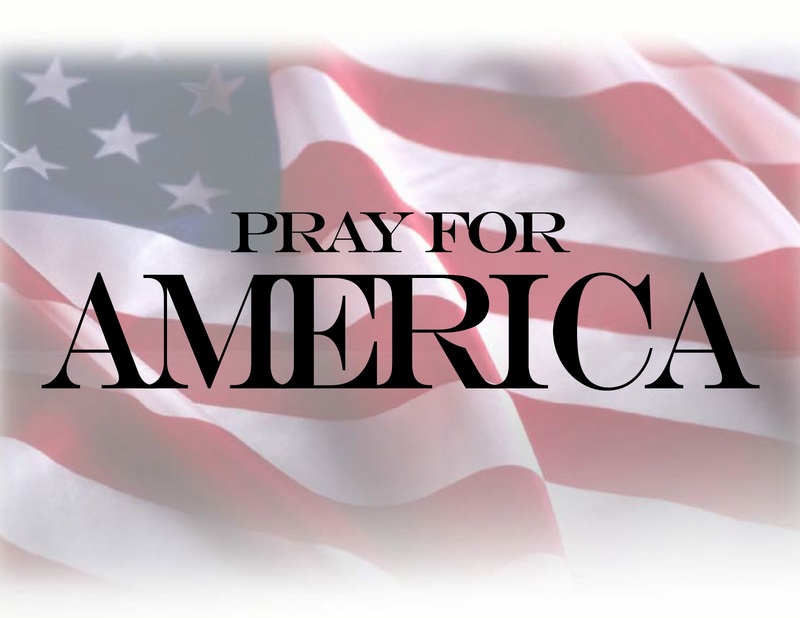 The Billy Graham Evangelistic Association published this article on Palin’s visit. Note the photo at the end of the article with what seems like a never-ending line of people waiting for a signature. With the backdrop of a sunny sky and an unseasonably warm temperature, hundreds lined the sidewalk on the grounds of the Billy Graham Library, waiting to meet Sarah Palin, former governor of Alaska and 2008 vice presidential nominee. Palin visited the Billy Graham Library for a tour and a signing of her recent book release, Good Tidings and Great Joy: Protecting the Heart of Christmas. In 2010, Palin and some of her family members travel to Haiti, where they visited a Samaritan’s Purse cholera clinic and help distribute Operation Christmas Child shoe boxes. In 2009, Palin visited Billy and Franklin Graham at Mr. Graham’s Montreat home in the North Carolina mountains. Today, she finally had the chance to visit the place the bears the name of one of her spiritual heroes. Gov. Palin also visited with volunteers of Operation Christmas Child and expressed appreciation via her Facebook page for their dedication. Today we had the honor of meeting Samaritan’s Purse’s Operation Christmas Child volunteers at the processing center in Charlotte, NC. I was blown away with the energy and joy there! My family was blessed a few years ago to participate in this mission in Haiti with Rev. Franklin Graham, Greta Van Susteren and her husband John Coale. It was heartwarming to see children’s faces light up when given a Christmas gift box packed with love! It’s a tangible way to show kids they matter and they’re loved. Operation Christmas Child relies on volunteers; and today we met many of these hard workers who make the program possible. There are about 75,000 volunteers serving in a three-week timeframe at processing centers across the nation. That’s more than 395,000 volunteer hours! 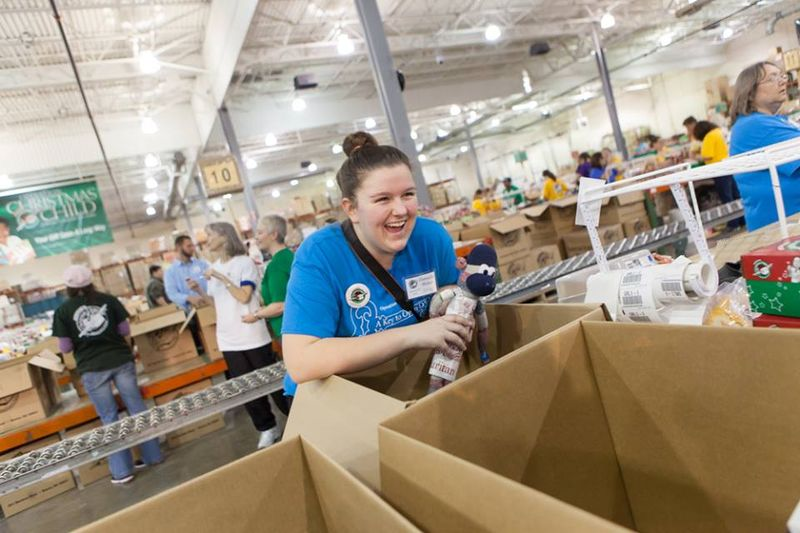 The Charlotte processing center alone has 28,000 selfless workers packing more than 2 million gift boxes. This year’s collection goal is 7.2 million gift boxes domestically and 9.8 million worldwide. Without these volunteers none of it would be possible! Their great efforts ensure gift boxes reach children all over the world, and more importantly, they send the love of Christ, reminding all that Jesus is the reason for the season. It’s the true Christmas spirit in action! There’s an additional 13 photos on Palin’s Facebook page chronicling her visit with the Samaritan’s Purse volunteers. The Charlotte Observer also published a photo gallery of Gov. Palin’s visit with the volunteers here. Palin’s book tour will take her to both Roanoke, VA and Monroe, LA tomorrow, December 7th. It was such an honor to participate this morning in Liberty University’s final Convocation for 2013! A big thank you to the students and faculty and especially to President Falwell for the kind invitation. As I mentioned this morning, places like Liberty University inspire me. This young university is educating a whole new generation of American leaders who understand the positive effect our Christian heritage has had not only in our personal lives, but also in the life of our nation. It was awesome meeting the students after the Convocation. Congratulations to everyone graduating this month. And best of luck to everyone else on their final exams! P.S. I enjoyed the tour of your beautiful Snowflex Centre. It’s not quite like the snow in Alaska, but pretty darn close! Gov. 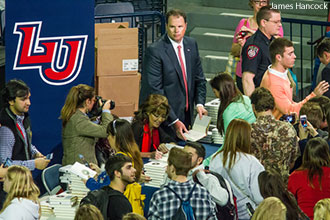 Palin also posted a gallery of 14 photos of her Liberty University appearance. Looks like it was a packed house! 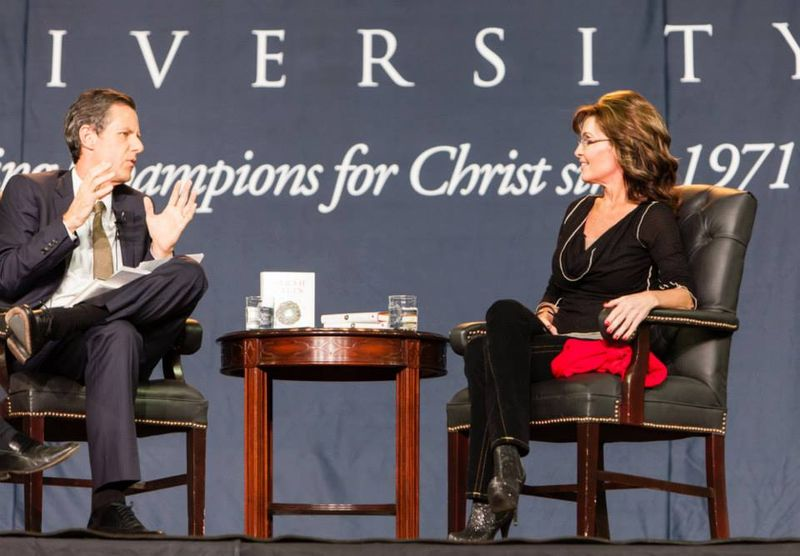 In a sit-down, conversational interview on stage with President Jerry Falwell, Jr. and Vice President for Communications Johnnie Moore, Palin talked about her motivation to keep standing for “time-tested truths” — the same truths Liberty upholds — when she is attacked by the mainstream media for her conservative views. 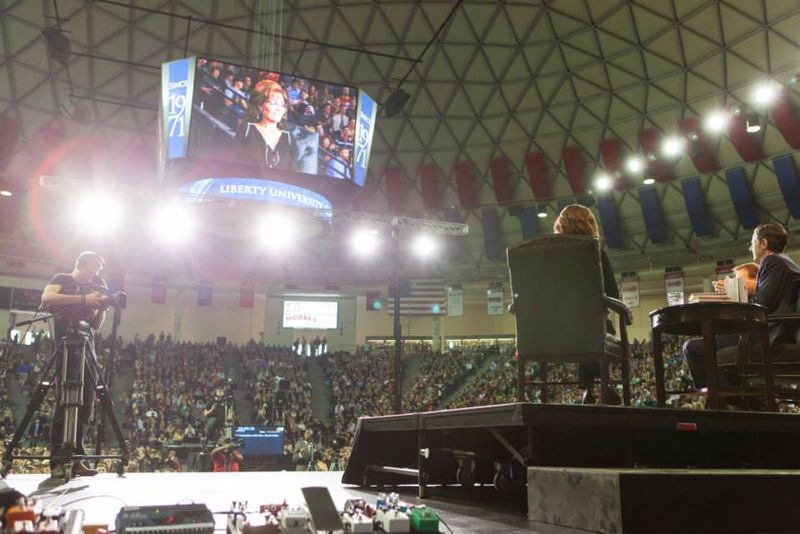 Palin, the first woman and youngest person to be elected governor of Alaska and the country’s first female Republican vice presidential candidate, has visited campus before, but this was the first time she has appeared at a Liberty event. She said she was amazed at the campus transformation that has taken place since she was here a few years ago. “You guys are doing an awesome job; it’s amazing, the infrastructure, additions to the amenities, what a wonderful force for good in this part of the nation and for the world,” Palin said. Coming off a 15-city tour for her new best-seller, “Good Tidings and Great Joy: Protecting the Heart of Christmas,” she talked about the larger message that the Christmas story brings today. She said the tour is about more than a book; it is about restoring our nation’s principles. 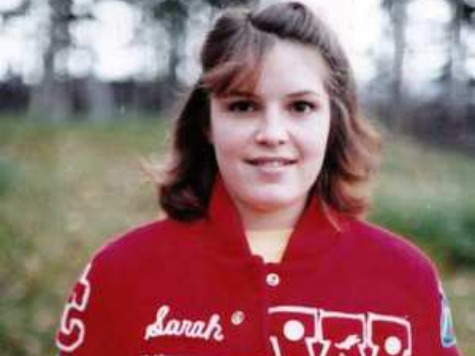 Students submitted their own questions for Palin, which ranged from who her biggest inspiration is (her youngest son, Trig, who has Down syndrome and has taught her “the world’s standards of perfection are not God’s standards of perfection”) to her family’s favorite Christmas memories (eating moose chili and traveling “over the river and through the woods” by snow machines). Looking back at where God has taken her, Palin still calls her rise to a position of leadership “bizarre,” but credits it as God’s work. Once Liberty University uploads the video of today’s event I will update this blog entry. P.S. 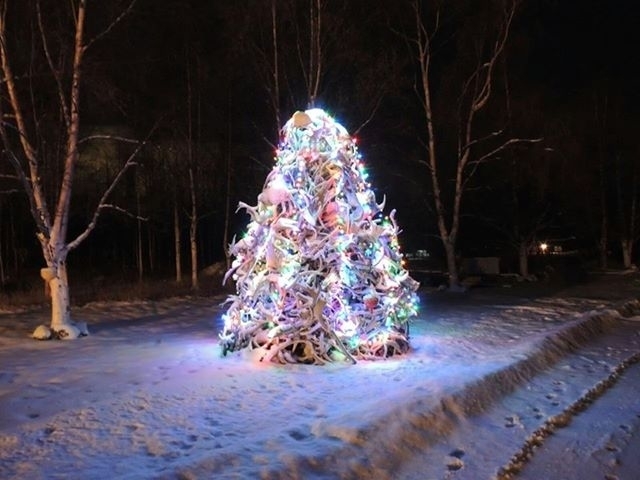 This is a photo of the Heath antler pile that I wrote about in “Good Tidings and Great Joy”! MONROE, La. (KNOE 8 News) – Former Vice Presidential candidate Sarah Palin will visit Monroe on Saturday. Saturday’s visit will take place at the Books A Million location on Lamy Lane from 6:00 PM to 8:00 PM. Wristbands will be distributed beginning at 10:00 a.m. on Friday, December 6th at the Monroe Books-A-Million store location. Each individual must purchase a book from Books-A-Million to receive a wristband (with the exception of children) for the book signing event. 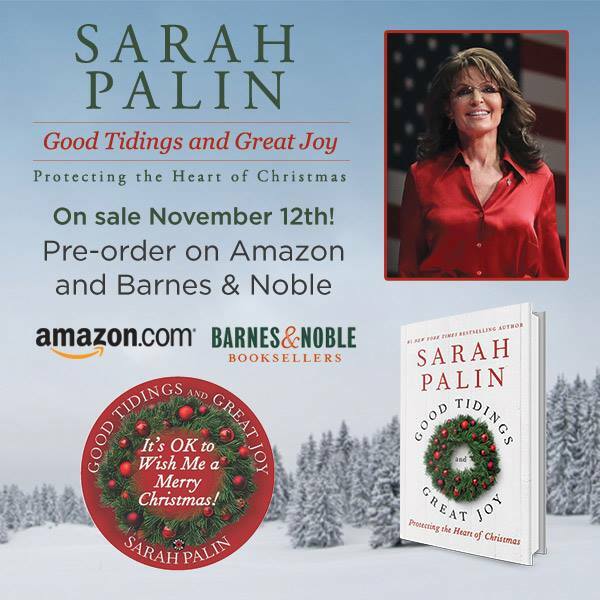 Customers can return on December 7th to get their book signed by Palin. 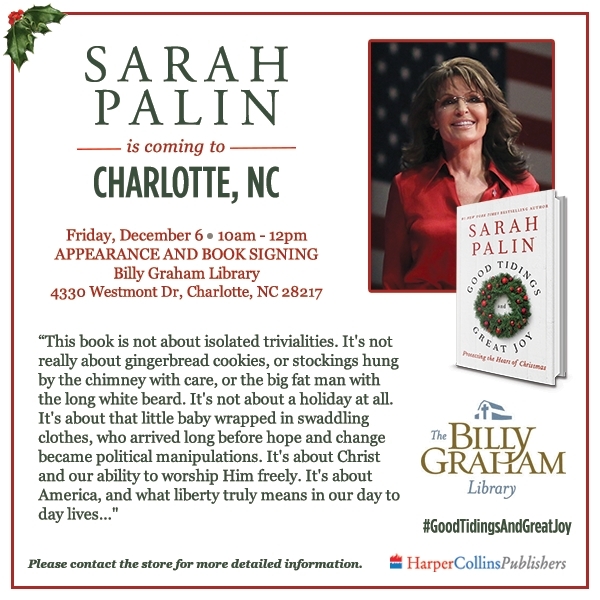 You can also find Palin’s tour dates with publisher HarperCollins here. Sarah Palin spent another day greeting supporters and signing “Good Tidings and Great Joy” in Wausau, WI. Perhaps the most interesting story of the day is that Walmart had 700 books on hand and it’s being reported that the store sold out. In fact, Breitbart has confirmed that Sam’s Club as well as Barnes and Noble sold their complete inventory too! Special note: Gov. Palin also shared this article on her Facebook page. 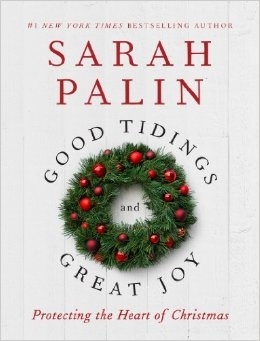 When former Alaska Governor Sarah Palin went to Wausau, Wisconsin on Thursday, the whole city sold out of her new book, Good Tidings and Great Joy: Protecting the Heart of Christmas. Palin held a book signing at the local Walmart, where a line snaked around the gigantic store (see video below) for the sold out book. Breitbart News has confirmed the town’s Sam’s Club and Barnes & Noble also sold out all their copies of her new book as well yesterday. At Walmart, Palin greeted a multitude of well-wishers and signed book after book. Just like her Bethlehem, PA stop, she stayed late because of an abundance of supporters. She may have stayed later if not for one very relevant detail. According to a Walmart official, the store ran out of books. RIB MOUNTAIN — Carrie Kolbeck traveled all the to way to Fairbanks, Alaska, four years ago just to get a chance to hear her political hero, Sarah Palin, speak. So when the Wausau woman heard the former Alaska governor and vice presidential candidate was coming to town while on a book tour, Kolbeck immediately made plans for a second meeting. You can read the rest of the Wisconsin Rapids Tribune article and view the video here. Thank you, Wausau! It was great to visit with so many patriots yesterday. Thank you for letting me wish you a Merry Christmas! The Wisconsin Free published this article on Palin’s book tour with an interesting quote. Day 4 will take Palin to Ft. Campbell, KY and Ft. Benning, GA. The book tour schedule is available here. More stops after Thanksgiving? How about New Jersey Gov. Palin? Looking forward to heading out on the first leg of our “Good Tidings and Great Joy” book tour! I wanted to share with you some of the pre-Thanksgiving schedule and details. (More to come!) We look forward to seeing you on the road, having the opportunity to spread the positive message of this book and really share in the true spirit of the Christmas season. I promise we can make these fun events for all! While our schedule is pretty packed, we plan to stop by local charities that embrace the spirit of Christmas year ’round to thank them and highlight their good work. And you never know when we’ll “Go Rogue” and pop up somewhere else. Merry Christmas! Can’t wait to see you! Our prayers are with Congresswoman Jaime Herrera Beutler and her family. Congresswoman Jaime Herrera Beutler (R-WA) is pregnant with her first child and it’s been discovered that the baby has Potter’s Syndrome. You can read more at Life News. As a mother I find this story simply heart-breaking. 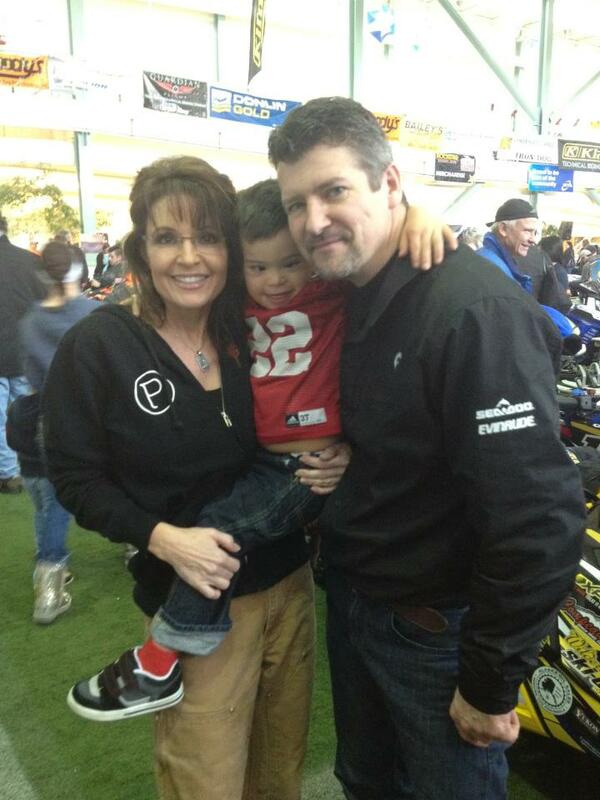 I will join Governor Palin in praying for this family and their unborn child. My friend Kevin Scholla has landed a position as a contributing writer over at Breitbart Sports and he has a fabulous piece that was published earlier today. Kevin had the privilege of interviewing Chuck Heath, Sr. at which time they talked about all of the Heath kids, hard work, and the life-long value of playing sports. One thing Sarah Palin is known for is her toughness. In order to deal with her detractors and the lamestream media, she has to have thick skin. She has to be a pit bull with lipstick. A barracuda. No one has been attacked so personally and so consistently in recent years more than Governor Palin, yet through it all she keeps on keeping on with drive, passion, and that winning smile. Palin’s incredible spine of steel and servant’s heart come from a foundation in faith and family, but perhaps her tenacity comes from somewhere else. Perhaps sports and all that comes with being a part of a team were the catalyst. Chuck Heath Sr., Palin’s father, seems to think so. Governor Sarah Palin sent Valentine’s Day wishes to her supporters today via Facebook.